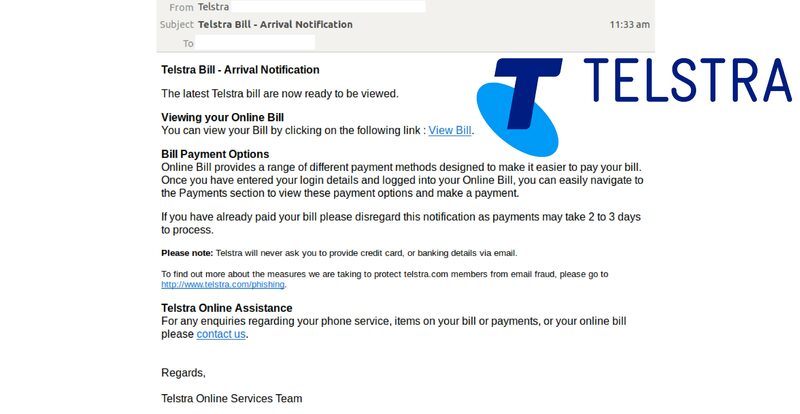 Telstra customers are advised to be on their guard, as a new phishing email scam purporting to be from the company is currently hitting inboxes. MailGuard intercepted the fraudulent emails today afternoon (AEST). Masquerading as ‘new bill’ notifications, the emails use the display name ‘Telstra’ and were sent from a large number of compromised email accounts. All sending addresses as well as links within the email are all part of the same collection of compromised domains. 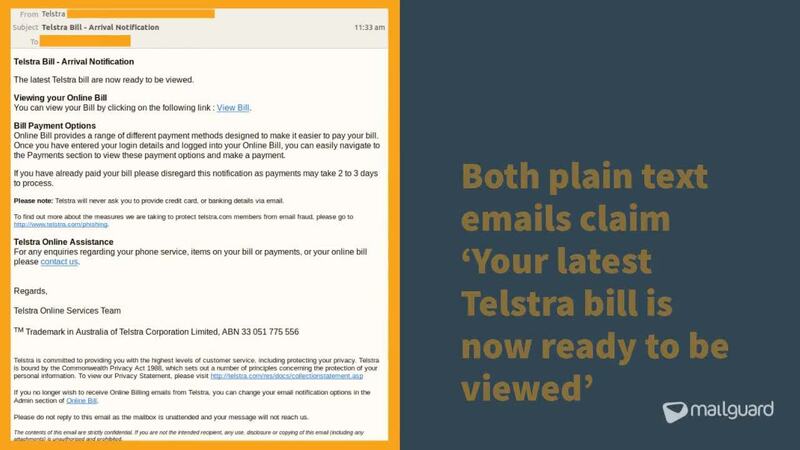 The body of the email is relatively simple and uses plain text to advise recipients that their latest Telstra bill is now ready to be viewed. A link for "View Bill" is provided in the email. Unsuspecting recipients who click on the link to view their bill are led to a blank webpage that serves up a malicious file download. While this scam isn’t as sophisticated in design as others that MailGuard has seen, cybercriminals do use several elements within the email body to convince recipients that it is a legitimate notification from Telstra. A key feature is the inclusion of the sentence ‘Please note: Telstra will never ask you to provide credit card, or banking details via email." 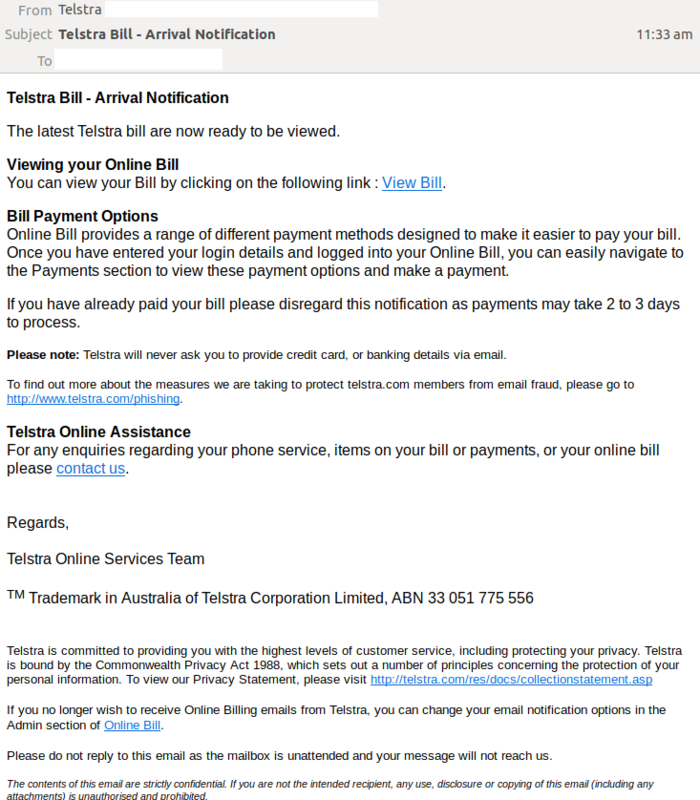 This disclaimer, along with the included link to the telecommunication company’s phishing advisory page, boosts the credibility of the email as it is a common feature that recipients are used to seeing in legitimate notifications from Telstra.